Shriram General insurance provides all kind of insurance in India ranging from motor insurance to fire and theft etc. For assistance with buying car insurance or 2-wheeler insurance online or as a matter of fact any kind of insurance; Please call them at their toll free numbers at : 1800-180-7474 & 1800-300-30000(Toll Free) These numbers are available for Monday to Saturday 8.00 a.m. to 8 p.m. and Sunday (including Holidays) 9.30 a.m. to 5.30 p.m. Surprisingly they function on holidays too else public sector insurance companies only function 5 days a week i.e. Monday to Friday. Protection from a financial loss arising out of loss or damage to your vehicle. Protection from liability towards third parties for personal injury and property damage. Protection in case of accident for you (personal accident) and your dear ones traveling with you. Enhanced protections through unique add on covers. Protection for your investment in CNG kit, electrical and non-electrical accessories etc. 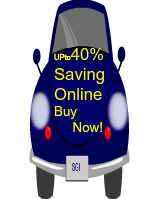 Save upto 40% on car insurance premium. It’s fast, easy and quick. Direct settlement facility at special garages! Remember to keep visiting our website for your free stock tips and financial advice and do remember to share through social network as sharing is caring.